A brownstone obelisk in the Kensington section of Berlin may be the first Civil War monument erected in the United States. The monument was dedicated July 28, 1863 –- less than a month after the Battle of Gettysburg and 20 months before Lee’s army surrendered at Appomattox Court House, Virginia. The front (northeast) face of the monument bears the dedication “Erected to commemorate the death of those who perished in suppressing the Southern rebellion,” as well as a poem “How sleep the brave who sink to rest, by all their country’s wishes blest” and the year 1863. The word “Soldiers” appears in large inscribed letters at the monument’s base, and the front of the obelisk also bears a state of Connecticut seal. The northwest and southeast faces of the monument both bear the names, and the location and date of death, of four residents. The southwest face bears the same information for eight residents killed in the conflict. The names were added after the war ended. The monument, at the intersection of Percival Avenue (Rte. 71) and Sheldon Street, was designed by Kensington resident, Nelson Augustus Moore, a noted landscape artist and photographer. The Kensington monument may have been the model for a nearly identical obelisk in East Berlin. 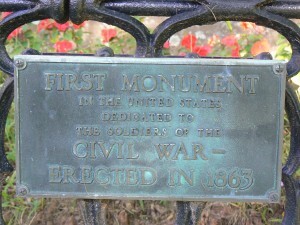 The monument is surrounded by an ornate fence, to which two plaques have been affixed. 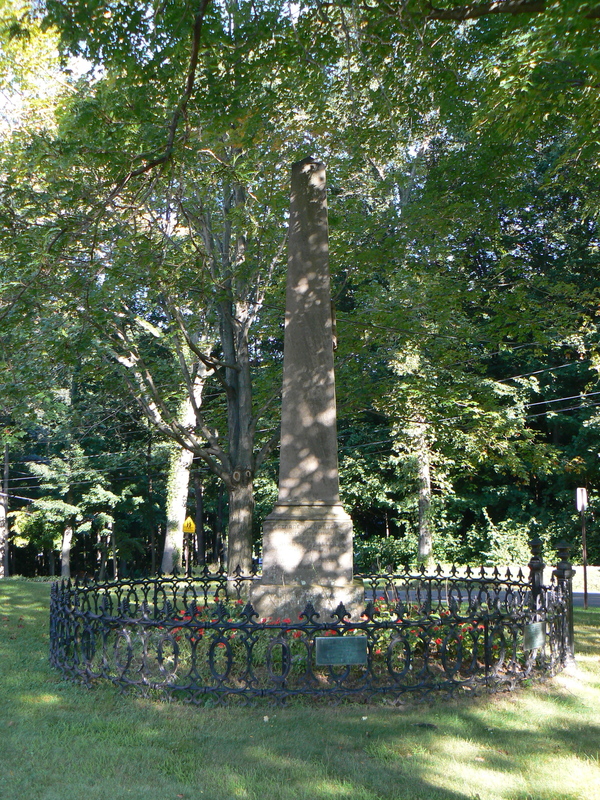 One plaque lays claim to the Kensington obelisk being the “First monument in the United States dedicated to the soldiers of the Civil War – erected 1863”. The second plaque was added on Memorial Day of 1961 by a local political party to commemorate the 100th anniversary of the start of the Civil War. Whether the Kensington monument actually is the first in the United States is difficult to prove either way. 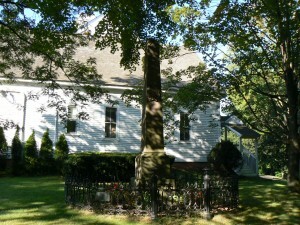 The Connecticut Historical Society believes it is the first in New England. 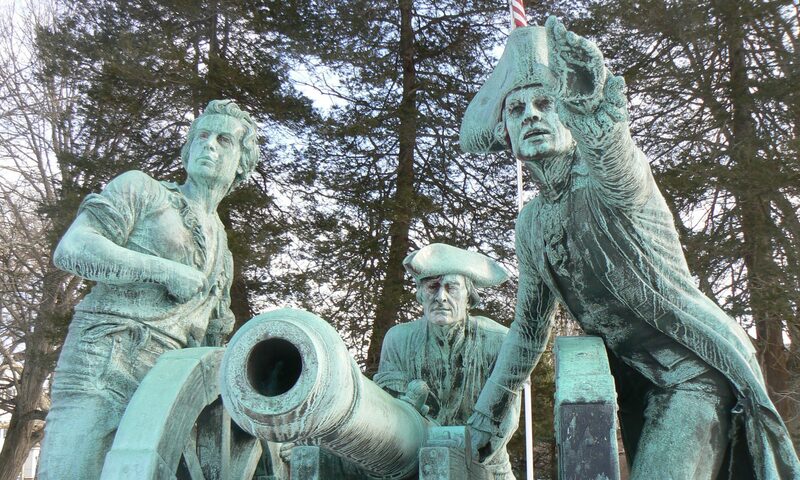 A monument in Lancaster, Wisconsin, claims to be the first Civil War monument erected through public subscription. Fundraising began in 1862 but the monument was dedicated in 1867, a date by which several monuments had been dedicated in Connecticut alone. A cannon was added to the site in 1913 as part of 50th anniversary ceremonies. 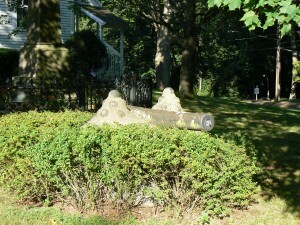 The cannon may soon be in danger of being swallowed by surrounding shrubbery. 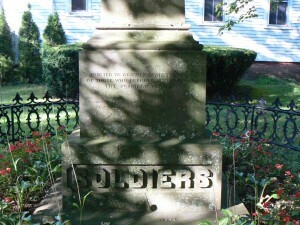 Previous PostPrevious Soldiers’ Monument, Port Chester, N.Y.